I finally decided to post a picture of Bryan and I...decked out in our Purim finery. 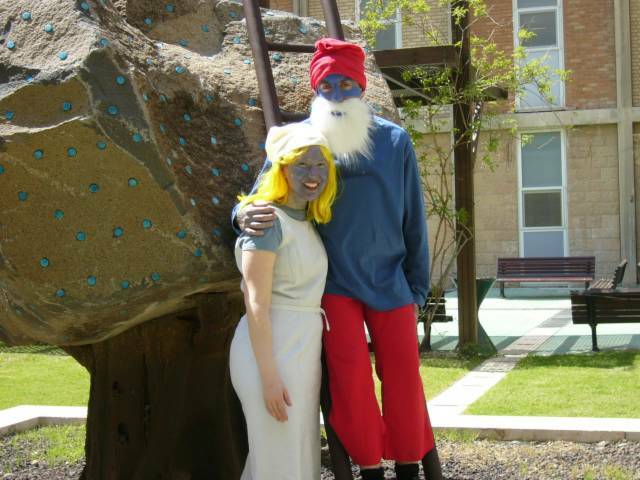 Hebrew tip of the day - Smurf in Hebrew is "dardas", so Bryan is Dardas-abba and I am Dardasit. The picture was taken in the quad at my medical school, where for reasons I have yet to understand there is a small statue of a tree that looks exactly like the Smurf tree. Maybe the Smurfs had mystical healing powers? As we last left off the saga, Bryan and I were expecting the guests to arrive for our engagement party. First my in-laws sent my parents a huge, beautiful arrangement of flowers, then Bryan sent me a bunch of multi-colored longstem roses. Our place was beginning to look like a florist! Then the guests started arriving, and it is amazing how you actually do not get to talk to everyone. How does that work at the wedding? If at a party with 100 people I couldn't manage to even say Hi to everyone, I am scared to think how many people I will not get to speak to at the wedding. Bryan and I did the math, and if we speak to every guest at the wedding, assuming 350 guests (a conservative estimate - it will likely be more) then we have approximately 28.35 seconds to speak to each guest to cover all the territory. Weird. Bryan and I both spoke (as opposed to all the other parties where I have comfortably settled into the role of letting Bryan be the mouthpiece). I spoke about 3 of G-d's 13 attributes of mercy (mentioned in last week's parsha) and the 3 that stuck out as personality traits of Bryan's - namely, slow to anger; full of kindess; and full of truth. As evidence of the last one I discussed how openly honest Bryan was the first time I saw him drunk, and how he could not stop telling everyone in the bar we were at how much he loved me. The clincher was when he turned to my little brother (then celebrating his 21st birthday) and said, "Yo, Judah, I love your sister so much I'm proposing to her!" This, mind you, a full month before we got engaged. Then the food poisoning hit. All evening long I had been feeling a bit queasy, which my MIL attributed to nervous stomach. I tried telling her it was not nerves, but no matter. Eventually the pain got so bad I had to leave my own party, and lay doubled over in pain in the TV room. My sweet baby sister tried to bring me milk to sooth my stomach, but I fortunately noticed the curds floating in the milk before I took a sip. Eventually, Bryan and I left in a taxi, where I jumped out at my apartment and Bryan continued on in the taxi to his place. The second I got out of the taxi I was like a hose. I could not stop vomiting. I called Bryan, crying, and said, "Come back! I'm sick. ", and he turned around and helped clean me up. I don't know why, but I always cry when I vomit. Some weird causal relationship. But at least Bryan and I have now passed the "puke barrier". As soon as Bryan left my place, he too felt violently ill. To make a long (and very gross) story short, Bryan and I both got food poisoning from Limonim. The new restaurant Gilly so enthusiastically recommended in the Khan theatre. Bryan was sadly ill from Sunday night through Thursday morning. He even spent his birthday at the doctor's. SO my recommendation is, don't ever eat there. While I was eating my dinner, I thought it tasted atrocious. Like rancid beef. Which it was, as it turned out. But I didn't make a fuss, and ate as much as I could stomach, because we were guests of someone else and I didn't want to makea big deal in front of my new relatives. Our tip-off should have been either a) the rancid taste of the beef [Bryan seemed to think that because the place is named Limonim, lemon must be the theme and thus the sour taste of my food was not spoiled meat, but rather the lemony flavoring they must put on all the food] or b) the fact that one of the other patrons got up in the middle of their meal, and vomited over the balcony just outside the restaurant. To Limonim's credit, when I called to notify the manager of the food-poisoning, which was most definitely from Limonim as my in-laws and Bryan and I ate exactly the same food for 4 days straight except the meal we had at Limonim, he immediately offered us a free meal. As if I could ever eat from there again. Any word having to do with lemons now sends Bryan straight for the bathroom. Besides being crippled by food-poisoning for a few days, the rest of the week was rather nice. I played nice more with my in-laws. I was actually sad to see them go. I really like Bryan's parents. His mom is a genuinely nice person and his dad is a lot of fun. All my friends thought he was a DILF. I leave in a few hours for New York City where I, along with another blog friend will be spending a few days spreading the message of aliyah. I hope I make it, due to the snow. But in good news, i have found the wedding dress of my dreams, at 1/3 the price available here, at a store in New Jersey and have an appointment Thursday to go buy it. I hope I like it as much in real-life as I do on the internet. If not, I am at the point where I will be wearing jeans to my wedding.